Having a rhinoplasty or nose job surgery takes motivation, guts, and resolve. You’ve been thinking about it for a long time and you finally have the courage to act, but now you must find the best nose job surgeon. 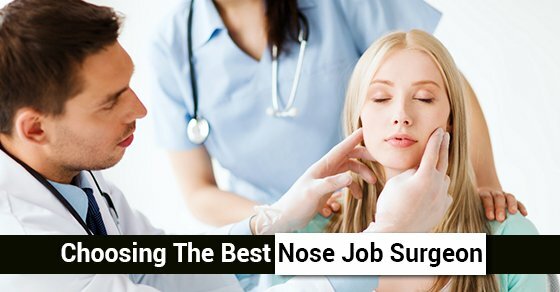 So how do you go about choosing the best nose job surgeon? A nose job is not cheap and it’s serious surgery. Therefore, look for a surgeon who will provide lots of information without a lot of pressure. You have numerous questions about results, the process, healing time, and medical complications. Look for someone who provides all this information, but does not rush you into a decision. Instead, the best nose job surgeon will carefully explain what is to come and patiently answer all your questions. They will not rush you through the consultation and will give you ample opportunity to make an informed decision. Avoid a quick consult and high pressure. Look for clear and concise pricing and whether your type of surgery can be covered by insurance. Do your homework. Search out the truly best rhinoplasty surgeon. You have your choice of doctors who perform various kinds of plastic surgeries. There are only a precious few who are true specialists in performing nose jobs. The best nose job surgeons will be trained in the function of the nose but will also have sound aesthetic judgement. Find out how many surgeries the doctor has performed, ask about their credentials and if they are Board Certified. The best nose job surgeons will be able to show you a sketch along with your simulated results. Dr. Oakley Smith limits his practice to only rhinoplasty. He has perfected not only his technique but has trained countless young surgeons. Dr. Smith is the only surgeon in Toronto specializing in plastic surgery of the nose. Having a nose job surgery is fraught with doubt, anxiety and excitement. Find a doctor and staff who will be sensitive to all these emotions. Look for a doctor and staff who have a reputation for treating you with the same care on your last follow-up appointment as they did at your consultation. Seek a doctor and staff who willingly provide referrals to previous patients. Finding the best nose job surgeon requires due diligence but the rewards are life changing.